Well, were moving forward with our list of 100 Essentials this week with our Amp-3 Outfitter and Wound Care & Suture Kits. 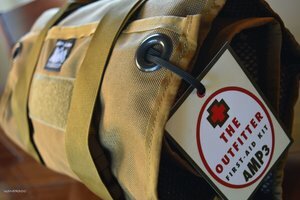 Item #34 the Amp-3 Outfitter is the most Comprehensive Medical Kit on the market and the only one Made in the USA! This kits goes for Trauma to Dental in our Clinic in a Roll. Weighing just under 8 lbs rolled up and ready to go. Put together our Mastering Your Med Kit DVD ($35) that goes over pocket by pocket on how to use everything in our kit. Our customer made bag is David's design and manufactured in the USA. We pack most of our Modules in LokSak's that are also made in the USA! LokSak's are Waterproof down to 200 ft and completely air tight. With so many choices for Medical Kits on the market. This is the only one designed by a ER Doctor with materials that he actually uses. This product was two years in the making and is now one of our Signature Kits. Currently priced at $395, available in ACU Digital, Coyote Brown, Black, Burnt Orange and Red. Item #35 is Wound Care & Suture Kits. David being a ER Doc, our Wound Care and Suture Kit is more comprehensive then any other kit on the market and Made in USA. Our Survival Suturing DVD, goes over Wound Care, as well as when to suture and when NOT to suture. Hoping that these two kits will add some needed essentials for your Preparedness. Well that's it for this week, thank you for following along and supporting Amp-3!! !